I love posting EMPTIED features because knowing I used up a product or two helps me feel justified with my excessive purchases. Although I still feel bad for my skin since I use so much stuff on it (especially when I'm trying out a product for review). Sometimes, my skin rebels on me by breaking out (like it is doing now, oh dear); but often it's worth it because I get to share with you guys what products are worth checking out in the market. Read more after the jump! Summer has of course meant skin damage somewhere between the days that rained and shined in the Philippines. 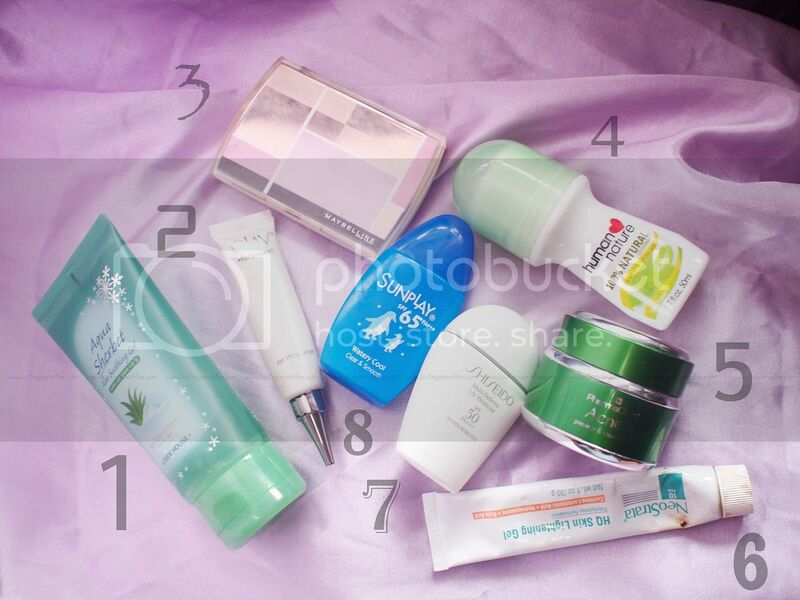 To quickly share, here are my emptied products for June--most of which are aftermath of my Summer Skincare Habit. 1. Etude House Aqua Sherbet Aloe Soothing Gel--this I couldn't live without during the late months of April and the early months of May. Come late May, I started using this moisturizer sparingly because I didn't want to run out of product but the dreadful day had to come and I did run out hence it's part of this EMPTIED post. This gel-type moisturizer is very light weight and as the name suggests, it feels like aloe gel through and through. I can't really tell much on it being soothing but because of it's consistency, I have to admit this did treat my skin very well during those sunburn moments. 2. Olay Regenerist Eye Cream--I am very particular with packaging and as much as I can, I stay away from beauty products that are in jars/pots/tubs. I prefer them in bottles with pumps, atomizers, or squeeze-type tubes so yes I'm very happy that Olay Regenerist Eye Cream is in one of my preferred packaging forms. One should be very particular with product hygiene especially for products used around the eye area since this part of the face is very sensitive and delicate. Although I can still be proud to say that I'm yet in my matured skin years, prevention will always be better than cure. Given the fact that I will always be a wrinkly face (from all that smiling and bitchin' hehe), I do the best I can to prevent and cure fine lines. Olay's Regenerist range, specifically this eye cream, is a great choice for that particular task. 3. Maybelline AngelFit Ultra Natural Affinity Foundation in Natural Beige Ochre*--I absolutely love this foundation and I lament using it all up. In my defense, I hit pan not for my own doing solely but also because my sister also LOVES this foundation to bits. This applies on smooth and perfect on the skin and it has mini pink shimmer that helps reflect light for a clearer complexion. Maybelline and I really hit it off with this baby doll. PS. This is the only EMPTIED make-up product that I have to share for now. Frankly, I don't often have EMPTIED make-up products! I usually end up giving them away to friends/relatives or throwing them out! 4. Human Heart Nature 100% Natural Aloe Fresh Deodorant--since I started using Human Heart Nature's Sunflower Beauty Oil for my armpits, I didn't bother look at any other deodorant to match it with. Based on experience, I realized going natural especially for the armpit area can offer dramatic results. My armpit lightening experience is still one of my most popular blog post to date--check it out here. This Aloe Fresh variant has a more comforting and familiar smell than the original pink deo. I also regard green as my favorite color so I am all hands up for Aloe Fresh! Although it will not prevent sweating (I don't mind because I would really prefer letting the toxins out of my system); this deodorant helps prevent foul odor caused by accumulation of bacteria. Because this deodorant is all natural, it is a preventive option should you wish (of course you do) to avoid darkening of the underarms. Check out the beautiful Human Heart Nature store! 6. NeoStrata HQ Skin Lightening Gel--yet another dermatologist issued skincare product that was prescribed specifically to target acne scars. Technically, this ain't EMPTIED as much as it expired. Sadly, it's color and consistency suddenly changed after long-time rest and I was appalled to notice the change! Sad cause I really need to lighten a few acne marks here and there. Would I recommend this, just for its delicate storage requirements, I won't. It really ended up looking Betadine-gross! 7. Shiseido Multi-Defense UV Protector with SPF50*--I blogged about this baby here where I believe I have shared all there is to say about the product. But as recap, let me just point out that this water resistant sunblock is quite nice and comfortable to use even when it's humid outdoors. I know a lot of people are hesitant in using sun protection because of its trademark sticky feel but trust me when I say, you don't have to worry about that with this Shiseido creation. 8. Sunplay SPF65 Watery Cool Clear & smooth sunblock*--this is the BEST and most refreshing sunblock I've ever tried. "Watery Cool" indeed best describes it. :) It has a minty after feel and it is very lightweight, applies on clear and it silky smooth to the touch. Since it is recommended to use a daily sun protection (no the SPF of your make-up will not do--you need ACTUAL SPF for this) Sunplay's Watery Cool variant makes a great choice. It's so light and absorbent, you wouldn't feel icky even if you apply on your usual skincare and make-up routine over it. How about you? Any emptied products you would like to share? Share through the comments! I'd love to know what you can't get enough of! PS. It's been raining almost everyday... I've been wearing boots. Congrats on emptying all those products! I think I saw EH Aqua Sherbet Aloe Soothing Gel on sale at EH stores for 30% off, if ever you'd like to repurchase. :) I used to have the same Maybelline foundation, and I agree that it's one great product! I like the dress very nice. whoaaa you emptied so much stuff! i only go through my stuff every couple of months and it seems like forever. that etude gel looks really good, i def wanna look into that one! I'd like to try the shiseido sunblock, ive been eyeing on it but still saving up! hehe. Emptied jars, it is a good feeling. Very interesting armpit post. I didn't know deodorant stained armpits? Weird! I always empty anything Cetaphil. Hi sis! I just want to ask something about acnex, Is it really working on acne? I have acnex clear but I am afraid to use it because when I looked at the ingredients I saw some ingredients that are comedogenic. I wanna know if this product doesnt give you breakouts or tiny bumps? Thank You!